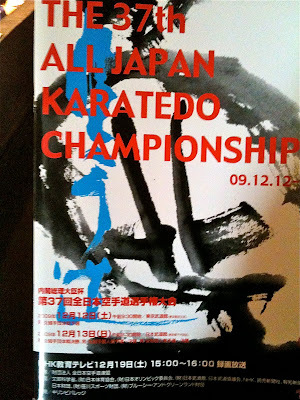 Saturday's events were the Prefecture Team Kumite division up to the semi-finals, held at the Tokyo Budokan. Individual Kumite Round 3, individual Kata up to semi-finals, Individual Kumite round 4, Team Kumite Finals, Individual Kumite to semi-finals, Kata Finals, then Kumite Finals. 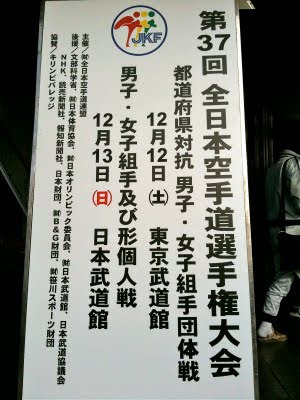 The sign outside announcing the tournament, that December 12 is for Team Kumite and December 13 is male and female Kumite plus individual Kata. Saturday was at the Tokyo Budokan and Sunday was at the Nippon Budokan. 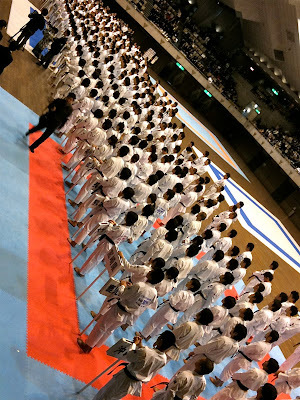 The athletes lined up by prefecture for the opening ceremony on Saturday.